The Fujifilm FinePix F70EXR is the successor to the F60fd, inheriting Fujifilm’s EXR technology which was introduced earlier this year on the FinePix F200EXR camera. The F70EXR's 10 megapixel, 1/2-inch Super CCD EXR sensor essentially turns it into three kinds of camera in one, offering three selectable modes. One mode captures the highest resolution possible, another the lowest noise, and the third the best dynamic range, with the camera able to automatically choose the most suitable for the current scene if you're at all unsure. Other standout features of the FinePix F70EXR include a 10x wide-angle optical zoom lens (27-270mm equivalent) with a CCD-shift dual image stabilisation system, 2.7 inch LCD screen, Face Detection 3.0 technology, Super Intelligent Flash mode for flash-assisted macro shots, self-explanatory Portrait Enhancer mode, new Pro Focus Mode and Pro Low-light modes which take advantage of the F70EXR's multi-frame technology, and ISO settings of up to ISO 12800. The F70EXR also offers creative exposure modes in the form of aperture-priority and full manual, making it more appealing to the keen shutterbug. With a competitive launch price of $279.95 / £229.99, we find out if the Fujifilm FinePix F70EXR is the best compact for photographers. The Fujifilm FinePix F70EXR is a fairly compact digital camera that just fits into the palm of your hand. With dimensions of 99.3(W)× 58.9(H)× 22.7(D) mm and weighing 180g, this is a camera that you can slip into a pocket or small bag and not notice until you need to use it. It's externally very similar to the F200EXR model, with very similar subtle curves on the top, left and right of the metal camera body. The principal external differences are the F70EXR's smaller 2.7 inch LCD screen, and its much more versatile 10x, wide-angle 27-280mm lens - an impressive feat by Fujifilm's engineers given that the two cameras are virtually identical in size. The Fujifilm Finepix F70EXR is quite pleasing on the eye, with either a champagne or more serious black colour scheme and a rounded, compact appearance, and it retains the excellent overall finish that we've come to expect from Fujifilm FinePix F-series cameras. The Fujifilm FinePix F70EXR is a little more tricky to hold than it really should be, with your right thumb naturally positioned on the round Mode Dial on the back of the camera, and a tiny handgrip on the front. Your right forefinger is then free to operate the shutter button and the tactile zoom lever, which surrounds the shutter button. Thankfully, despite the smooth all-plastic body, the camera is not too slippy when gripping it. The various buttons are well-made and easy to operate, and the camera feels well-balanced in your hands. Overall the Fujifilm FinePix F70EXR is well constructed and designed with no obvious signs of corners being cut - even the tripod socket is centrally located. The Fujifilm FinePix F70EXR has relatively few external controls, just 10 in total, although it does offer a much wider range of photographic controls than the number of controls would initially suggest. All 10 external controls are clearly labeled using industry-standard symbols and terminology. You can set the flash, macro, self-timer and exposure compensation options by clicking on the four buttons around the navigation pad. As with most other digital cameras, the Fujifilm FinePix F70EXR has a Menu/OK button in the centre of the navigation pad which, as you would expect, gives you access to the main software menu system. Depending on which shooting mode is selected, this lets you set various parameters including auto-focus, metering, continuous mode, image stabilisation, plus the Setup menu, which offers 23 options that you will probably set once and then forget about. There is also a small button above the navigation pad marked "F", which opens what Fujifilm call the F-Mode menu. This allows you to set the ISO speed, image size and the film simulation mode. All of these are also replicated in the main menu. Due to the 2.7 inch LCD screen, the various options and icons are perfectly easy to read. The Fujifilm FinePix F70EXR's Mode Dial allows you to quickly change the camera's shooting mode. The 8 modes are Auto, EXR, Program/Aperture Priority, Manual, Movie, Scene, Natural Light, and Natural Light & Flash. The Mode Dial has a fairly positive action, but I did get caught out on a couple of occasions when it had been inadvertently moved to the wrong position whilst stored in a pocket. The Program setting on the Mode Dial can be toggled between Program and Aperture-Priority in the main menu, although disappointingly there are just two f-stops available in aperture-priority, wide-open f/3.3 and stopped-down f/11 (depending upon the zoom setting). There's also a Manual mode which lets you set both the shutter speed and the aperture, although again there's only the same two aperture settings to choose from. The aperture is set by pressing up and down on the navigation pad, and the shutter speed by pressing left and right. A simple horizontal line in the bottom-right of the LCD screen helps you to set the correct exposure. Note that there is no dedicated shutter-priority mode. The EXR shooting mode is by far the F70EXR's most exciting, headline-grabbing feature. There are three different EXR options. Resolution Priority (HR) mode uses all 10 megapixels to capture the highest resolution image, much like any other camera. High ISO & Low Noise (SN) mode combines adjacent pixels to create larger photodiodes and improve low-light quality, producing a 5 megapixel image that makes dark scenes as bright and detailed as possible with minimal noise. D-Range Priority (DR) mode simultaneously takes two images at different exposures and then combines them to produce a single 5 megapixel image with increased dynamic range (up to 800%), preserving detail in the shadow and highlight areas that would otherwise be lost. If you can't decide between the three modes, EXR Auto will automatically select the correct one for the current scene. In practice, EXR Auto picked the mode that I personally would have chosen about 90% of the time, so you can safely leave the F70EXR on this setting and not worry about having to keep changing the EXR mode. You can see the results of using the the different EXR modes for yourself on the Image Quality page. There is a side-by side comparison of the ISO speeds in Resolution Priority (HR) and High ISO & Low Noise (SN) mode, two examples which were shot using each EXR mode, with links to the original full size images, 100% crops and histograms, and an example which was shot using D-Range Priority (DR) mode at each % level, with links to the original full size images and histograms. Setting the camera to High ISO & Low Noise Mode produces slightly less noisy images at each equivalent setting, but the image resolution drops to 5 megapixels, the range is only 100-1600, and to be honest the difference between the two modes isn't as pronounced as we'd have hoped. The D-Range Priority (DR) mode is much more successful, resulting in images that have noticeably more dynamic range that those shot in the Resolution Priority (HR) mode, and far surpassing other compact cameras. If you want to shoot images that retain detail in both the highlight and shadow areas, this mode and this camera are made for you. The Pro Focus and Pro Low-light modes are brand new additions to the F70XEXR, using multi-bracketing technology to create DSLR-like effects. Pro Focus takes up to three different exposures at different focal points and aligns them to produce a single frame with a shallow depth of field, while Pro Low-light takes a series of four high sensitivity/low-noise shots in quick succession and combines them into an image with less noise than the single exposures. You can see examples of both shooting modes on the Image Quality page. The Natural Light mode forces the F70EXR to select a fast shutter speed in order to freeze subject movement more effectively, whilst setting a fast ISO speed without firing the flash for more natural results. It's an effective automatic way of taking photos of children indoors, for example. Natural Light and Flash is a little more exciting. When selected, the camera instantly takes 2 photos, one with flash, one without, giving you the option of which one to choose later (both are saved by the camera). The F70EXR doesn't feature the infra-red functionality that the more expensive F200EXR model offers. The LCD screen on the rear of the camera is a 2.7 inch model which only has an adequate 230,000 dots. The LCD monitor has a glossy finish which tends to show fingerprints, and it's also slightly recessed, which should lead to fewer scratches. There is no optical viewfinder on the Finepix F70EXR, leading to a few moments of frustration in very bright sunlight when it can be difficult to see the image on the monitor clearly. On a more positive note, it is viewable at 160 degrees both vertically and horizontally. The Face Detection function is accessed via a dedicated button below the navigation pad. This feature is a welcome one that works well in the right situations. It's really best for posed group shots where your subject(s) is standing still at a moderate distance, but it also works if the subject is moving quickly or has their head turned sideways or even upside down. Movement tracking keeps the camera 'locked on' to its subjects until they move out of the picture. Face Detection 3 detects up to 10 faces and is faster and more accurate than the previous iteration, especially with subjects that aren't looking directly at the camera, and also has the added benefit of also offering red-eye reduction if you require it. Fujifilm have included an image stabilisation system on the F70EXR. Activated via the Dual IS Mode Setup menu option, you can set the system to Continuous, Shooting Only or Off. The F70EXR's image stabilisation system uses a combination of mechanical CCD-shift and the use of high sensitivity settings of up to ISO 6400 to help keep shutter speeds high enough to avoid subject blur in low light conditions. Note that the camera will only automatically adjust the ISO speed when using the Auto shooting mode - in the other modes the ISO speed that you select will always be used, so only the mechanical CCD-shift part of the system is used. In practice I found that it does make a noticeable difference, as shown in the examples on the Image Quality page. You don't notice that the camera is actually doing anything different when anti-shake is turned on, just that you can use slower shutter speeds than normal and still take sharp photos. The Film Simulation setting is a throw-back to the days of film. Remember that? I doubt if most F70EXR purchasers do, yet Fujifilm still persist in referring back to their film past. There are five Film Simulation options - Provia, Velvia, Astia, Black & White and Sepia - with the first three supposedly mimicking the natural tones of Provia, vivid colors of Velvia, and the soft tones of Astia. Perhaps recognising that most users won't know what Provia, Velvia, Astia actually signify, the F70EXR also helpfully calls them Standard, Vivid and Soft. Film Simulation can also be used in combination with other shooting modes too, including EXR, so you can shoot a black and white image in D-Range Priority mode, for example. If you have never used a digital camera before, or you're upgrading from a more basic model, reading the comprehensive and fairly easy-to-follow manual before you start is a good idea. Unfortunately Fujifilm have chosen to cut costs and only supply the full manual as a PDF on a CD, rather than in printed format (there's just a short printed guide to the camera's basic features). Not much use if you're taking pictures and need to find out what a particular option does. The F70EXR's battery-life is a little disappointing, with the camera only managing 200 shots using the supplied NP-50 Li-ion battery, meaning that you'll need to carry a spare with you for longer trips. The start-up time from turning the Fujifilm FinePix F70EXR on to being ready to take a photo is quite quick at around 2 seconds, and it takes about 2.5 seconds to zoom from the widest focal length to the longest. Focusing is very quick in good light and the camera achieves focus most of the time indoors or in low-light situations, helped by a powerful focus-assist lamp. In the normal shooting mode it takes a snappy 0.5 second to store an image, with a very brief LCD blackout during which you can't take another picture. In Continuous mode the camera takes 1.8 frames per second at the highest image quality, not particularly quick, and it's limited to only 3 frames. There is a mode that allows you to take up to 12 frames at 4 fps, but only at 3 megapixel resolution. All in all the Fujifilm FinePix F70EXR is fairly quick in terms of operational speed. Once you have captured a photo, the Fujifilm FinePix F70EXR has a good range of options when it comes to playing, reviewing and managing your images. You can instantly scroll through the images that you have taken, view thumbnails (up to 100 on the same screen! ), zoom in and out, sort images by date, view slideshows with lots of different settings, delete, protect, trim, and rotate an image. You can also add a sound clip to an image, remove red-eye, resize for blogging, and set the print order and the transfer order. The Display button toggles detailed settings information about each picture on and off, such as the ISO rating and aperture/shutter speed. Disappointingly there is still no histogram available either in shooting or playback mode, which is now a long-standing omission on this range of cameras. 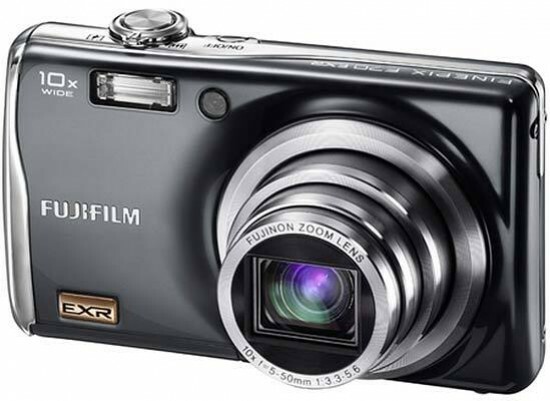 In summary the Fujifilm FinePix F70EXR is very much like its sibling, the F200EXR. This is a compact, well-built and easy to use digital camera with a refined and stylish design, which benefits from its manual shooting modes, very effective EXR technology and an extremely versatile 10x zoom lens.